This is ACEPC AK1 mini PC device, powered with Intel Celeron J3455 Quad Core Processor, 4GB of DDR3L memory, 32GB of eMMC and pre-installed with Windows 10. Check AK1’s bottom, and this model can add a 2.5″ SATA hard disk to expand storage capacity. You can also expand space capacity through internal SSD. Check below and this is a 2.5″ SATA SSD. When installation finished, connect ACEPC AK1 to your monitor, you will find 3 marks: one for internal EMMC (here is 32GB), another one is for SSD storage, the third one is for SATA hard disk. We check EMMC speed with Crystal Disk Mark, and found the result is satisfactory. When we test SATA hard disk speed with Crystal Disk Mark, we are happy to see the following result (HP Elite Slice has similar speed also). Last, we did an ageing test for 24 hours, and check the running status and device temperature. Check below, temperature gun points at the upper cover of ACEPC AK1 after 24 hours running, the temperature is only 40 degree. Check photos below, temperature gun points at the hard disk module of ACEPC AK1 after 24 hours running, the temperature shows only 32 or 33 degree only. Last, we show that the device ACEPC AK1 has worked for a period of over 24 hours. Both HP Elite Slice and ACEPC AK1 are very similar in shape. 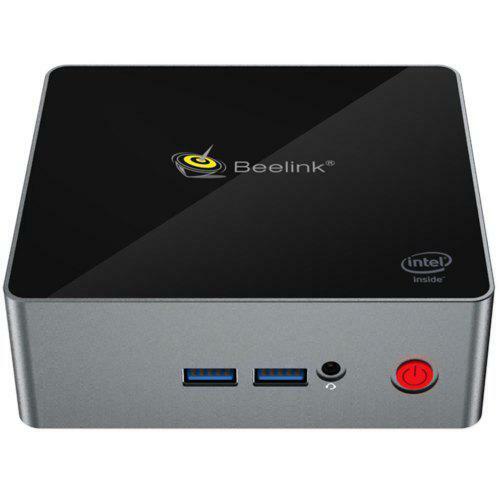 Any of them is a conventional business-focused mini desktop on the surface, but it also has a port on the bottom that allows you to stack it on top of other modules, adding and removing functionality as needed. As a result, we recommend ACEPC AK1 for those who has interest to buy a mini PC in near future.